AA SmartFuel is a convenient way to accumulate fuel discounts from both BP & Caltex in New Zealand. You do NOT have to be a member of the NZ AA to benefit from the power of accumulating discounts from purchases in AA SmartFuel retailers. For those who are not Full or Associate Members of the NZ AA there is the AA SmartFuel Card which enables the accumulating fuel discounts but not the roadside assistance & other benefits enjoyed by AA Members. NZ Online Pharmacy- Free Delivery anywhere in NZ, or overseas to your friends or relatives. It is as simple as making a purchase at any of the AA SmartFuel Retailers & swiping either your AA Card or AA SmartFuel Card. That 50 litre fill will save you a massive $38. It certainly beats the pants off other loyalty card schemes out there at the moment in NZ, where you have to spend a fortune to get a small discount off a smaller selection of available products. 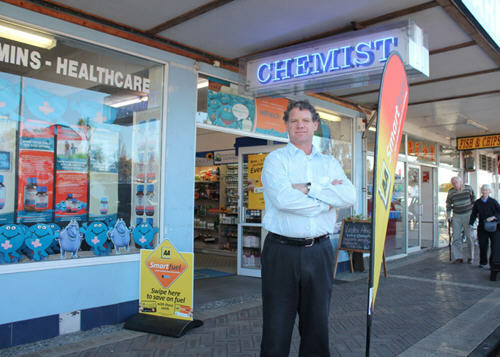 One of the most enthusiastic local AA Smartfuel Card outlets is Belmont Pharmacy in Lake Road, run by well-known local identity Allan Pollock and his wife Kathryn. "It is a real point of difference for us," explained Allan, when Channel Magazine popped in to see him in mid June. "This is one of the busiest roads in Auckland. It is estimated we have 30,000 plus vehicles driving past each day and now we have a huge incentive to be the preferred pharmacy for a high percentage of these people. They can save on their fuel with every purchase." Allan and his wife Kathryn are both pharmacists and have owned Belmont Pharmacy for over 20 years, since 1989. When they first bought the business Allan was one of New Zealand's leading mid-field rugby backs. When they met while attending pharmacy college in Wellington, Allan was a key member of the Wellington NPC team that included famous All Blacks Stu Wilson, Bernie Fraser, Alan Hewson and Murray Mexted. Allan followed 'Shore girl' Kathryn back home and they have been here ever since. He then played rugby for North Harbour and was also the coach when Harbour won the Ranfurly Shield in their historic victory over Canterbury in 2006. He has also had stints coaching overseas at Toyota and NEC in Japan. He currently oversees grade coaching at the East Coast Bays Rugby Club. The Pollock family live locally, close to Takapuna Beach. "We love living so close to the beach. It's one of the best urban beaches in the world. We are very lucky," says Allan. In addition to offering AA Smartfuel savings, Belmont Pharmacy also has other major points of differences. Kathryn Pollock is a trained Naturopath, so they offer a range of good health products as well as traditional medicines. Their focus of the seven-strong Belmont Pharmacy team is very much on providing the best service around health, so they don't stock non-health items items such as sunglasses and perfumes. "With AA Smartfuel, we really feel we have an advantage over other pharmacies offering FlyBuys and the like," adds Allan Pollock. "We are the only pharmacy in this area to offer AA Smartfuel savings and with our local service station being BP – that offers the AA Smartfuel savings – the fit is just perfect,"
Belmont Pharmacy, 143 Lake Road, Devonport. Phone 445-8247. Allan Pollock outside his Belmont Pharmacy. The soon-to-be-published study, written by the University of Auckland's Dr Laszlo Sajtos and Professor Peter Danaher of Melbourne's Monash University, concluded that big spenders - such as people who did their regular grocery shop at New World - were well rewarded by Fly Buys, so long as they saved their points for big-ticket items. "Hold on to your points and spend them on items such as a TV set or flights. The higher the retail price, the better off you are," Sajtos said. Although the average value of a point was 17c, points were worth upwards of 30c each when spent on more expensive items in the Fly Buys catalogue - such as the Le Creuset cookware range and luxury leather bags. A New World customer who spent $200 each week over three years, and picked up a couple of hundred bonus points along the way, would have enough to get a Phillips vacuum cleaner ($380 in shops) or a Breville mixer ($400 in shops). But consumers who swiped their card occasionally would get only minor benefits, because eligible rewards like DVDs and beauty products were not good value when bought from points, Sajtos said. "You would be better off paying cash in the open market."